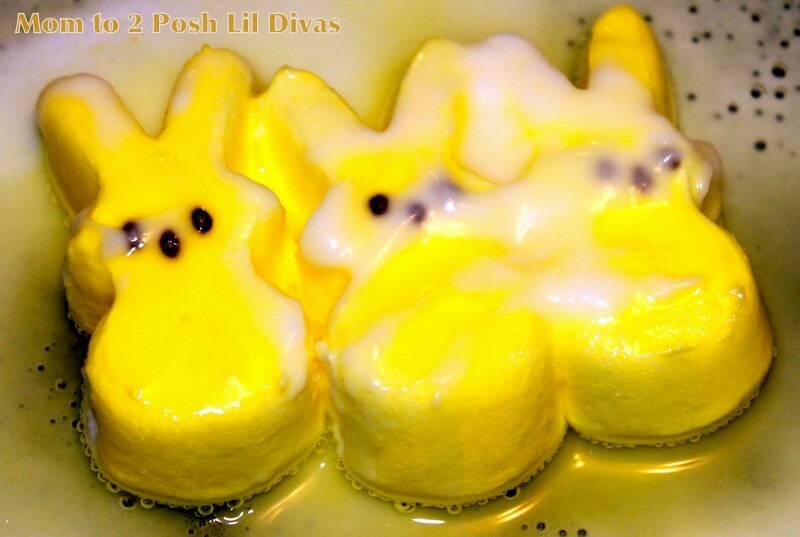 The Peep Experiments are in full swing & we are having fun coming up with ways to torture experiment on these hapless little marshmallow bunnies and chicks. 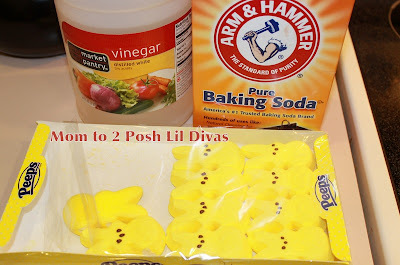 After our heated/microwave experiment we decided to experiment with some fizzy, bubble fun and see what effect baking soda and vinegar would have on our Peeps. I used a cake baking dish to contain the fizz/bubbling and it worked well. I did use a large tray underneath just in case but we didn't need it. 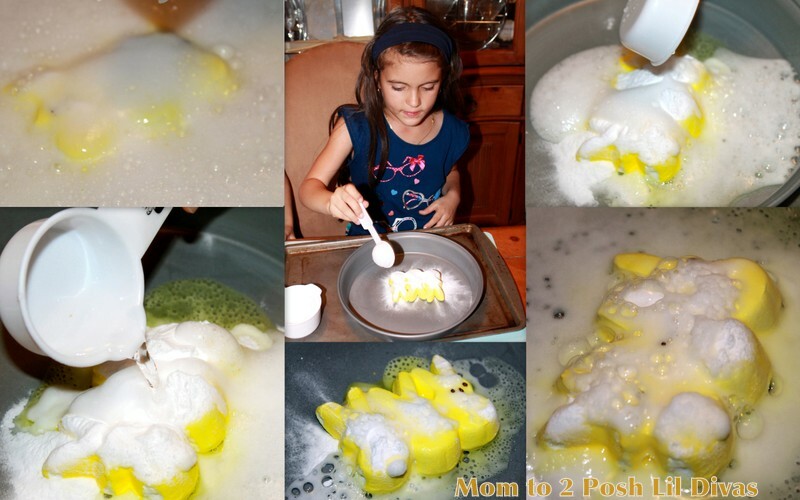 After lots and lots of baking soda and vinegar the Bunny Peeps were left pretty much intact. 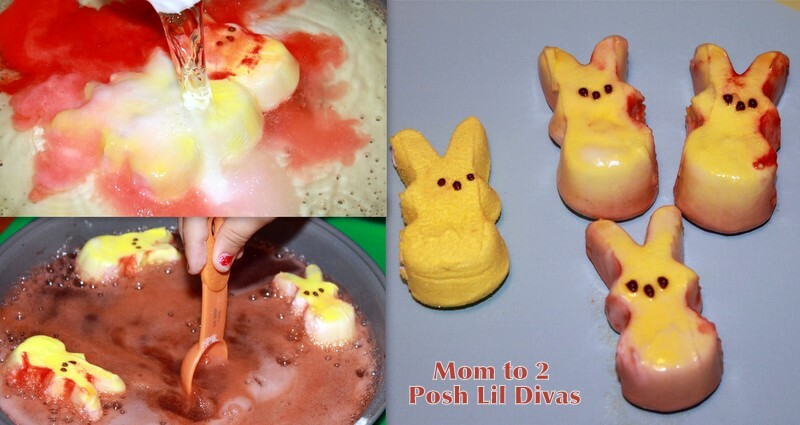 The only thing the Lil Divas noted was that the colorless vinegar had turned yellow. 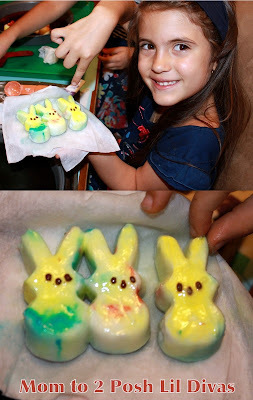 So, we know some color came off the Peeps but they looked pretty good. Then, the Oldest Diva asked if she could have some food coloring. 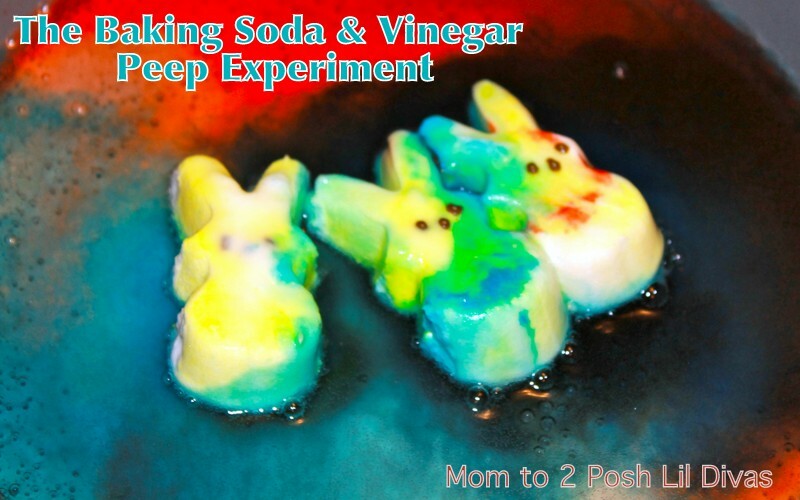 I know she was thinking of our fun baking soda & vinegar experiment where I surprised them by adding some hidden food coloring. 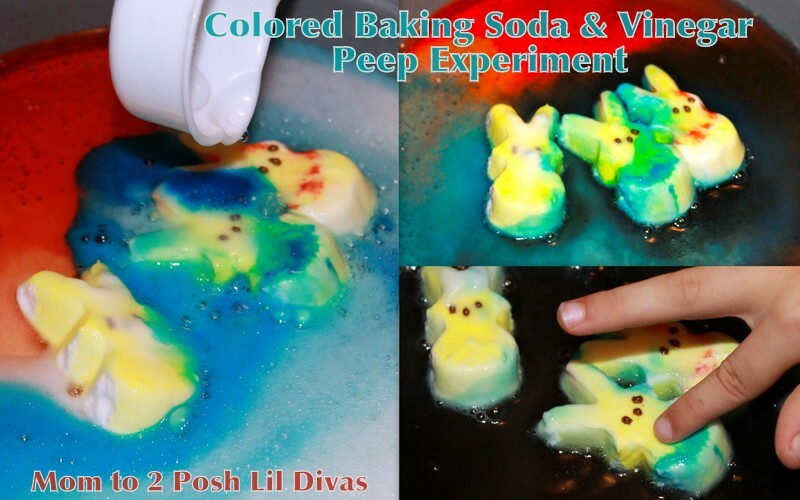 The Lil Divas added food coloring directly onto the Bunny Peeps and then added in the baking soda and vinegar. It was a color explosion which was lots of fun to watch. She repeated it a few times and then I asked her to look over the bunny and see if it had been affected. 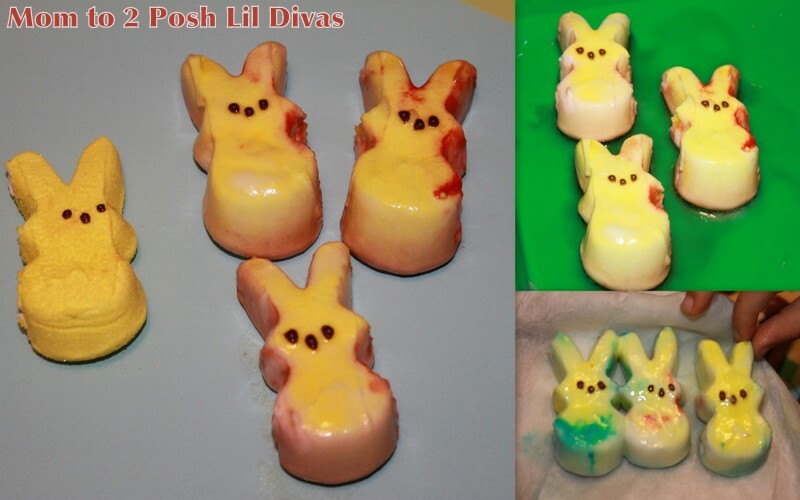 The Bunny Peeps had some hints of food color here and there but you can see they were still pretty yellow. They felt squishy to the touch but were still pretty solid. This experiment gave me the idea for peep experiment #3 coming tomorrow. What will it take to actually dissolve a Peep? Join us tomorrow to see what we found out. This looks like a fun series of experiments! Funny about them in your daughter's bellies. They actually look so tasty after all the vinegar - almost iced! I am curious too to see what makes those little guys dissolve! ;) Cute experiments. We may have to try them here! Thanks for sharing! What are 'peeps'? I am in the UK and hven't heard of them.... I am intrigued? 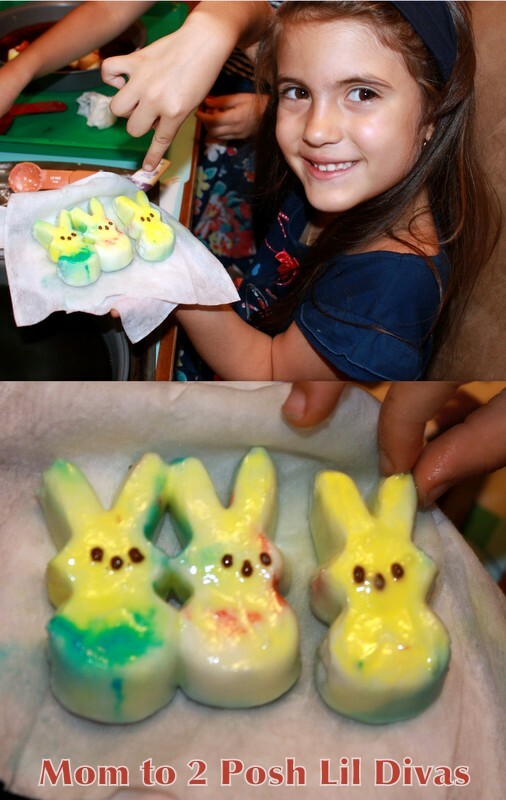 They are coated marshmallows in bunny & chick shapes. Big in the US for Easter. 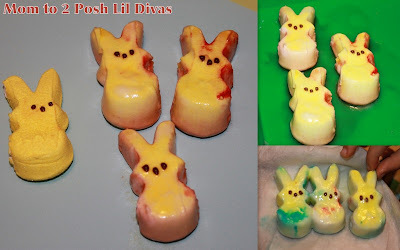 I don't know what you ended up learning about the Peeps, but here's a link to an article that made me laugh and cringe at the same time regarding these little treats. Thanks for that link! Totally added to my No More Peeps feelings! haha! you always come up with the greatest ideas....thanks for sharing on Hey Mom, Look What I Did at Adventures In Mommy Land! WOW! You all had a ton of fun with all of the Easter science experiments. Who knew Peeps could be tortured, I mean experimented with, in SO many ways! Keep up the great work. You can see the excitement for discovery and learning in your girls' eyes.